So I know I have been a little slow on the DIY train lately, but thank baby Jesus for today's guest who will pick up the slack for me! brittanyMakes is all about breaking down her amazing DIY projects step by step. And they are not just any craft project. I am talking pom pom curtains y'all. 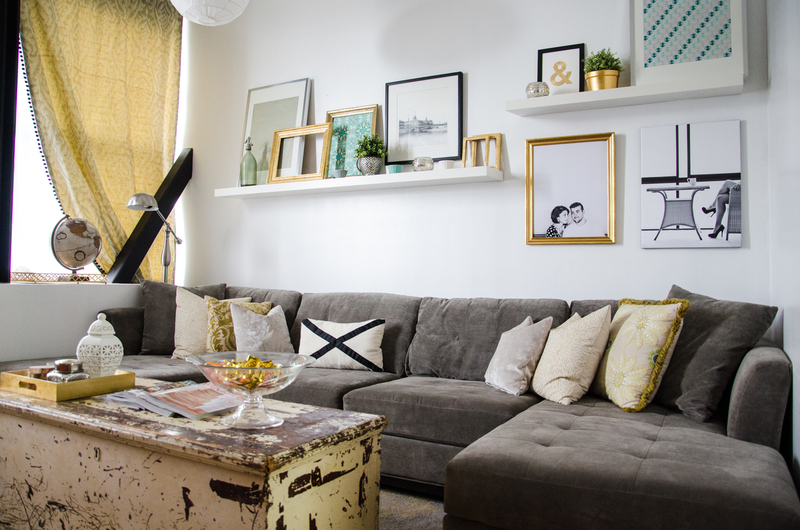 Today she is sharing her living room in her amazingly bright and inspiring loft. I love it and know you will too! Hello S&S readers! Let me just say I'm beyond thrilled to be here today! I'm Brittany, author of the blog brittanyMakes, where I journal projects and tutorials related to all things home design & DIY. Lindsay asked that I share with y'all my favorite designed space, which just so happens to be the room I spend the most time - our living room! Our living room just so happened to be the space that we "finished" first. Like most people, my man and I spend significant time in our living room, so we wanted it to be a space that felt fun, fresh, comfortable, and most importantly, a true representation of our lifestyle. My fiancee and I moved into our loft just about a year ago. We moved in with no furniture to our name, apart from our bed and a few items we bought off Craigslist. We designed our space gradually, in 'layers', with the first layer being most important: comfort. We went shopping for a sofa right away, and ended up finding the perfect double chaise at Macy's. Let me tell you, a sofa with a double chaise is amazing, you'll never have to call 'shotgun' over a chaise again! An important factor I took into consideration when designing our living room was how to make the space feel less bachelor-pad-like (as my man is ever so used to) and more sophisticated and adult-like. Hands down, the best way to achieve this is to find unique and clever ways to hide the clutter. I chose to use an oversized dresser, which we found on Craigslist, as a storage solution and TV console, which effectively hides all the DVDs, video games, and remote controllers. I bet you'd never guess how many BluRays are hiding in those drawers! I also love it because I get to store my go-to craft and jewelry supplies. Seriously, you'd never know! I created a layer of fresh sophistication by painting our TV stand/dresser in a bright shade of coral. You gotta love a pop of color, and this dresser completely takes the stage! Painting this dresser was the best decision I made. The final layers of designing a space come down to your choice of accessories and personal elements of style. 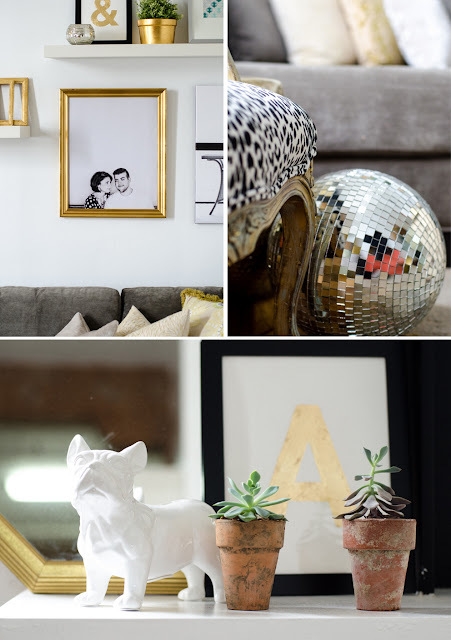 I love gold accents, fresh neutral patterns, subtle texture, greenery, and of course, bulldogs! I found a way to incorporate all the things I love by thrifting, collecting, and DIY-ing projects and items to make everything feel cohesive. Thank you so much Lindsay for letting me stop by and share with you our favorite space! I'm so honored to be a part of this killer series! Gorgeous. I love that dresser! Actually I love it all. love that leapoard chair - heaven! amazing job! Gorgeous! Brittany is such an inspiration. So cute! I want that chair...love the black, white with gold! Your blog is awesome Brittany! Gorgeous especially LOVE the leopard chair...tres chic! Brittany is so super talented and I love reading her blog! She has such great taste! What a dreamy space! All of the pieces and colors tie in so well together but still have an eclectic feel! 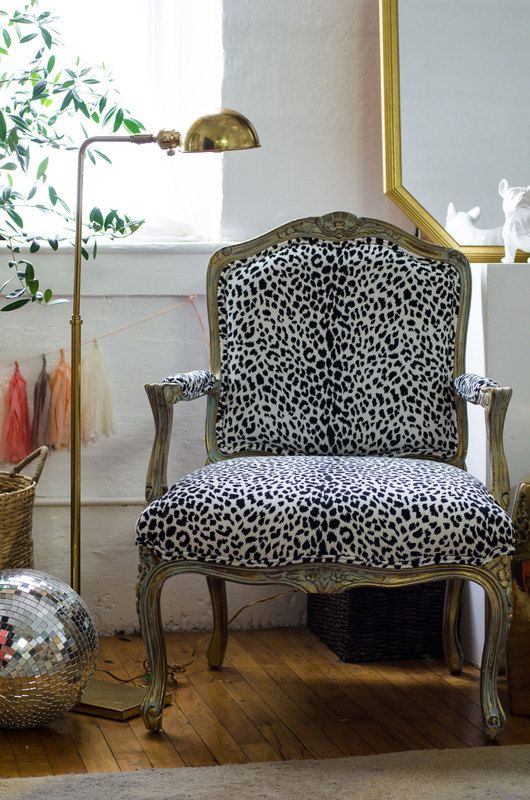 That chair with the leopard print fabric is so fabulous! What a beautiful space...and so perfect for a couple! Pops of color + neutrals to make the man happy! She did an amazing job! What a great space. 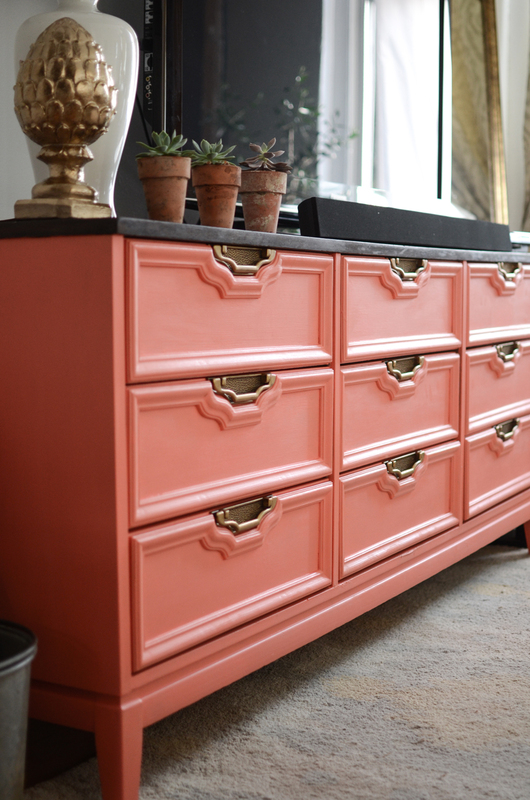 I love the dresser as a tv console and the bright pop of coral is a breath of fresh air! I love it!!! Especially the dresser and the styling with the mirrored disco ball. I selected that same sofa for a client last year! So fun to see it in a completely different application. i am loving all the details...great room! I have been thinking about a grey couch for my family room. I would love to have the double chaise deal so my daughter and I wouldn't have to fight over it! Thanks for the great list of where you got everything. I love the dresser--what color paint did you use?